The first time my husband suggested a month of no spending, back in 2012, I thought he was crazy. After all, by that point we had been married six years, and if he knew only one thing about me, it was that I liked to shop. Like many families, we were caught in a pattern of unhealthy spending habits. It wasn’t that we were constantly out spending wildly on big-ticket items, but our little daily habits were killing us. With two small kids at home, I’d often go to Target just to get out of the house. Of course a trip to Target also meant a stop at Starbucks and lunch at Chick-Fil-A, and then, because I was tired from a day of running around, it often meant ordering pizza or grabbing Chinese takeout on the way home. While we weren’t in debt, we weren’t making any headway either. Every penny that came in, we spent. Something had to give. We decided that we would challenge ourselves to an entire month of no spending. No eating out. No Starbucks. No Amazon.com. And definitely no Target. Furthermore, we would have to eat the food we already had stored up in our pantry and freezer. After all, I was really great at grocery shopping, but not always so great at actually using the food I had on hand. We would still pay our regular bills and our mortgage, but anything we could cut out, we would. For an entire month. I would have never guessed that 31 days of no spending could make such a significant difference in the way I viewed my finances, but it did. 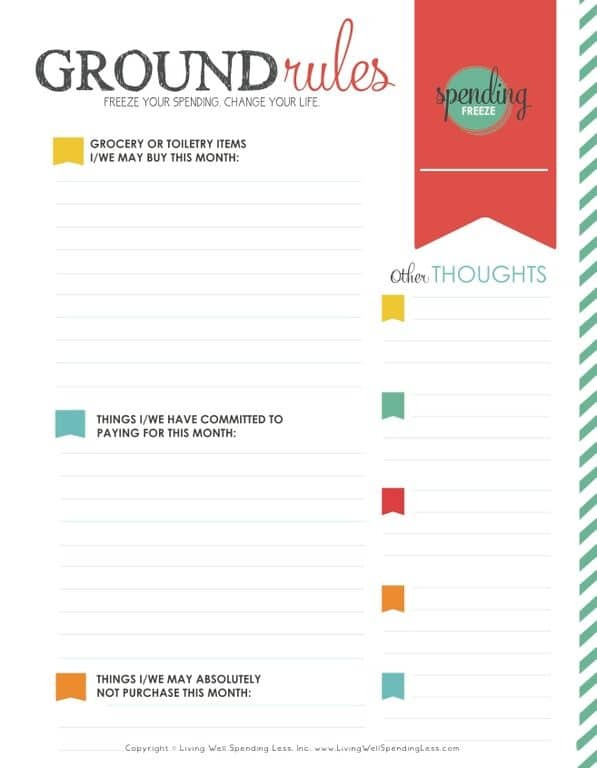 In the years since, we have continued to commit regularly to no-spend months, usually about twice a year. In that time, I’ve gathered quite a few tips and tricks along the way to make things a little easier, not only from my own experiences but also from many wonderful LWSL readers (just like you!). I have discovered that once you decide to embark on a no-spend month, there is a very important first step: to commit. This is the day we will change the way we look at spending. This is the day we will stop making excuses and stop justifying yet one more purchase. This is the day we will, for one whole month, commit to spending nothing. 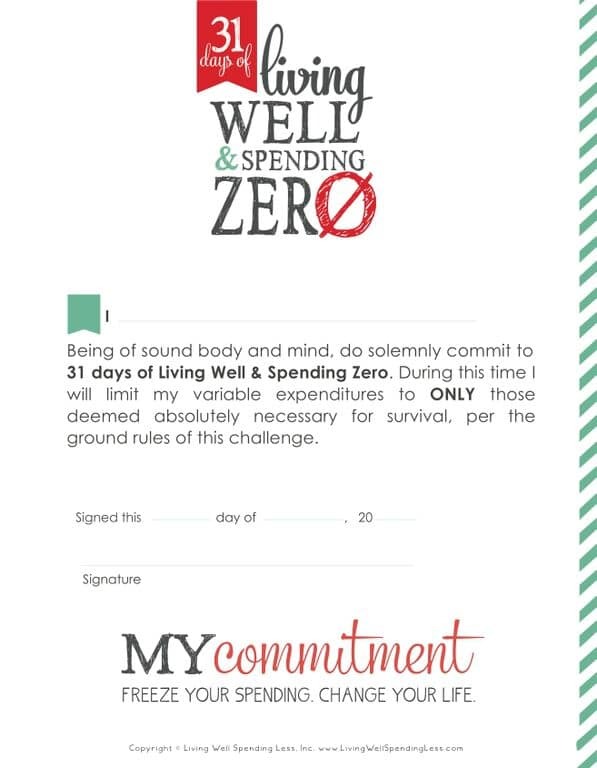 Right here, right now, I want you to fully commit to this month of living well and spending zero. Say the words out loud, preferably to your spouse and to your kids. Make it real. I’m not going to lie—at first it might be tough. But there is a secret to success. You have to be in—fully in, going head first and full force! (If you’re married, be sure your spouse is on board too.) 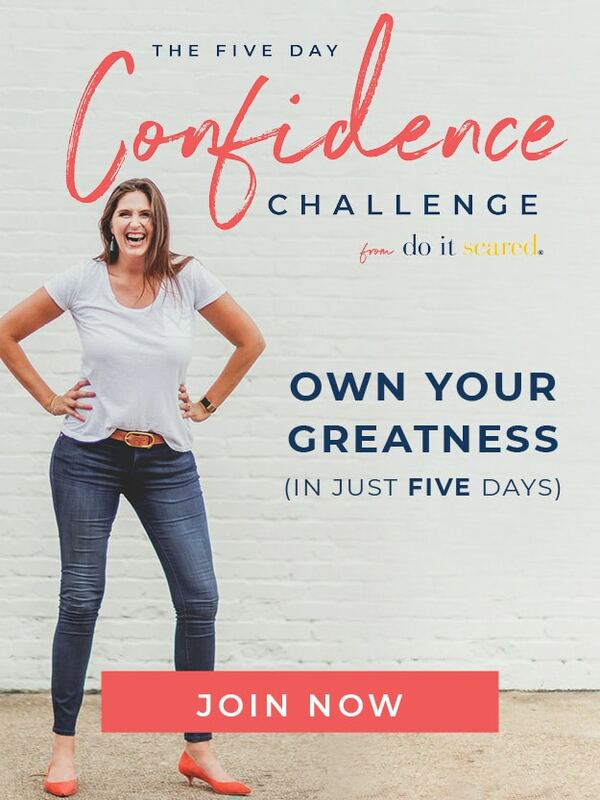 You can’t go into this challenge half-heartedly or you will fail. Get your printable commitment page here. Once you’ve signed your commitment sheet snap a picture and tweet it or share it on Instagram with the hashtag #31daysLWSZ! SIDEBAR: Even if you are not an Instagrammer, I highly, highly, highly recommend that you give it a try for the month (it’s free to join! ), as we will be giving away daily prizes! To participate, all you have to do is follow @RuthSoukup and use the hashtag #31daysLWSZ. Get more information about the contest HERE. But in the end, I was amazed to find we saved over $1,000. We found resources we had long since forgotten. We found items in the pantry we’d overlooked. We found toys that had been discarded. We certainly found creativity that we had stifled. I wish I could say we didn’t fight about money that whole time, but in a strange twist, we actually had a doozy of a fight when my husband wanted to spend a few dollars on something and I said no, that it wasn’t “essential.” (Let me tell you, having had all our previous money fights originate from my poor spending habits, it was practically like The Twilight Zone to have it go the other way.) But we lived! And when someone asked, at the end of the month, would we do it again, our answer was an emphatic yes! In fact, we’ve now gone through a handful of rounds of spending zero, and every time we do it, we gain new insights and greater appreciation for everything we already have. We have a life rich with faith, family, friends, and creativity. We’ve learned to be secure in the idea that a life well lived has nothing to do with what we have, but instead is made of who we are and what we do with what’s been given to us. Once you’ve signed your commitment, it’s time to set up the ground rules for your month. For us it was pretty simple: no spending on anything that wasn’t absolutely essential. Of course, I think one of the things that holds people back from actually committing is the fear that there is never a “good” month to make it happen. Every month, it seems, has some sort of special circumstance—a vacation, a birthday, a holiday. How do you work around those? The key is accounting for those special circumstances and planning for them ahead of time. I’ve included a worksheet at the end of this chapter that can help you do just that. Some of our readers have mentioned that they have been tempted to stockpile items before starting the challenge. If you have genuine concerns about essentials (yes, you can still buy toilet paper), you can start with a very limited trip to the store or allow yourself a minimal allotment for the basics ($25 or so should keep you covered). Assess what you have on hand, and remember: even if you’re spending the whole month eating mostly pasta or rice, you can make it. Don’t procrastinate and wait for the “perfect month” to begin, because there will never be a perfect month! If you have commitments like a big family event coming up, view the event as a challenge in your plan, get creative, and move on. A friend of mine made a sock monkey for a birthday gift, homemade valentines and an eggless cake, and still managed to make it through February just fine without spending a thing. The perfect month will never happen, so rather than putting it off, take the plunge! 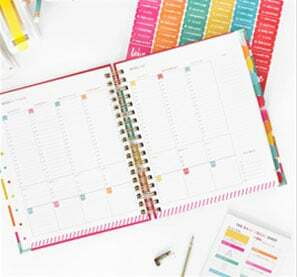 Create your own ground rules that account for your circumstances, and find the best ways to make your no-spend month work for you and your family. If you have an empty freezer and pantry, yes, you might have to do a little shopping beforehand, but keep it frugal and plan for the month. Get your printable ground rules worksheet here. What else can you add to this list right now? Throughout this challenge, there will be many different worksheets and printables for you to use. I suggest you print them out and organize them together in a binder or folder so you can journal as you go. Remember, I will be broadcasting LIVE each day on Periscope (usually between 10am and 11am EST). You can find and follow me at @RuthSoukup. Finally, be sure to check out our BLOG TOUR page, where you can find all sorts of additional ideas and inspiration from other bloggers who are taking the #31dayLWSZ challenge this month too! So are you ready? Let’s do this! 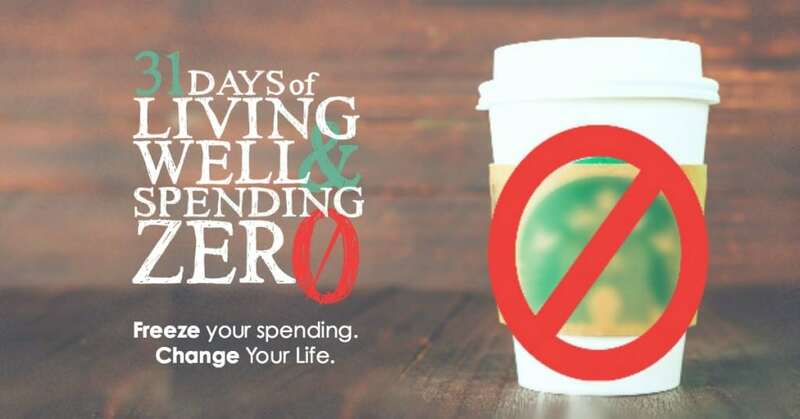 I would love to see a Living Well Spending Zero month focused on college students. I’m going to attempt to follow along this month, but the monthly necessities are different. Any tips? We need this. I have to contact the rest of the family before I commit. God has his ways of putting me in my place! Ironically the first time I’ve ever come across your blog and recources, it’s also the first day to the 31daysLWZS challenge. Something that I desperately need right now as I’ve started my new blog and want to purchase so many things to market with, take photos of and wear to look the part. Even though I didn’t get time to plan for this month, I’m going to jump right in and hopefully share my experience by the end of the month on my own blog with credits to you. Thanks for the resources – staying organized will definitely be a huge help during this journey. So excited that my husband and I are joining the challenge this year! Funny story starting out day 1 of the challenge. My daughter is a Type 1 diabetic. Long story short, she wears a pump and her meter communicates with the pump. Well, after last weekends camping adventures the $200 blood glucose meter got misplaced. After tearing the house apart looking for it this week, I finally threw my hands up and declared that who ever found it would get a cookie from one of our local bakeries that we LOVE!! Not realizing the time frame, yesterday I found the meter miraculously wedged between our camper’s spare tire and the camper itself. (Mind you the camper had traveled over 5 miles up and down a hilly road so it’s a miracle in itself that it was found!) Anyways, I declared myself the winner of the cookie but then realized what today was…Happy Spending Freeze October! So now it is my incentive to stay on track for the month! If I have a free drink on my Starbucks card, can I still use it? For some reason your printables give me an error message when I try to print it out. In fact, it prints out a little thing that says PCL XL error Subsystem: TEXT Error: Insufficient memory. Not sure why this happens. Hi! Do you have a similar challenge but on a smaller scale? Being single with no kids and living by myself means there’s no way I could spend zero on entertainment without going bonkers. Thank you! I’m also single and this will be my third time in three years doing this challenge and I know what you mean. Here are a few tips I’ve found: I made plans with friends for two nights out this month and, while I get dinner out, I don’t get any drinks. I’m hosting a game night / potluck one week and will have a great evening with friends at zero cost to me. If you are a reader sign up for BookBub and only “buy” the free books each day. Look in your area and find out which day(s) are free for locals at galleries and museums. Look for art shows and festivals in your area that have free admittance. Lastly, rope a few friends into this with you. It’s MUCH more fun when you’re not the only one on the plan. Most libraries have free internet, DVDs, and of course books. Many even have free Ebooks and readers to borrow! What are your regular ways to stay entertained? Well, honestly I prefer going out with friends. Staying home alone just isn’t a fun idea to me, and I’m at the age where it’s not possible to have friends over for a free night in. Haa! Karen my husband & I did the same! We have the old fashion tiny flip phones! Saved us a BUNDLE every month! 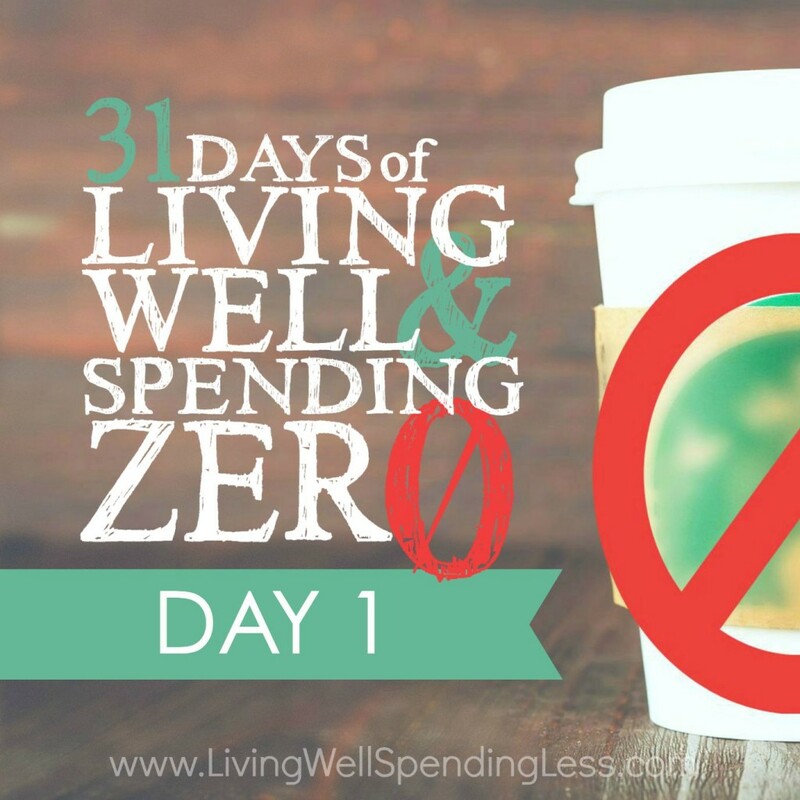 I think the thing that I am most excited about with this challenge is to break our family of some unhealthy spending habits. Just like you did, we keep catching our selves making small purchases here and there (My Target trips don’t help) and before we know it, our paycheck is spent. Ready to commit and break those bad habits!!! I would love to have taken this challenge this month. It is something that I have been wanting to do for years now. I have started picking an area and working on it until done. But this month is definitely NOT a good month for me. I am on vacation for 2 weeks! So I plan on doing this after the first of the year. November won’t work as Thanksgiving is another trip, and December, well, let me just say one word – Christmas. There is always some gift needed at last moment, some potluck dinner, etc. So I figure January would be a great way to start my new year off. I’m in! I’m in I’m in I’m in! For October, I’m in! The only thing I’ll be purchasing that I know of right now is my daughter’s halloween costume which has already been planned and budgeted for. So, I started reading about the challenge this evening and I am always looking for an opportunity to become more disciplined in our debt free journey. So, I am excited and nervous at the same time. But, as I tell my friends it is better to start rather than to sit back and wait. Peace and Love to All! With less than $25 in our pockets every week, all necessary bills pd, husband working 12 hr shifts 6 days a week we have been living with out food shopping ( except necessities like cat & dog, gas when needed) for past 2 months! I have been using our stash of put up foods, meats from butcher last year, and purchased long storage foods when digits were not an issue. I followed LWSL & a few others previous readings on how to accomplish it all. It has been a learning lesson for sure, tugging on God’s ear quite a bit of late yet in a very strange way I can honestly say I have never been happier! Thank LWSL for sharing your knowledge and “having my back” . I would do whichever is more comfortable for you! Catching up to this point is definitely doable, since all the first few days’ challenges have to do with food. However, if you want to do a full 31 days, you might want to go day by day. Will you be doing this again in November? I really want to try it, but being 9 days behind it seems like waiting might be best. I’m late to the party, but COUNT ME IN! This is perfect timing for me, coming hard on the heels of many family discussions about spending and committments to aggressively working on our debt. I love this idea, but find it extremely difficult. An example of an obstacle just today is that our office has decided to take the boss to lunch for her birthday. So, we all have to pay for our own lunch and contribute to her lunch, card, present, etc. AND, at the last minute (the day of) they changed the location to a very swanky restaurant where lunch entrees average $18. I’ll end up spending $25-30 on this lunch, and that’s without a drink! Of course, I could try to bow out, but feel that would have negative consequences within the office and with the boss. I’m irritated and feel trapped. TECHNOLOGY CAN HELP—WHY NOT USE IT? My wife found a great software to money management- Geltbox money – its Simple to use, quick and intuitive.